See the full schedule for The Knew You Tour! Claire Barnes is shattered when her husband, Greg, goes on a business trip and never returns. Unwilling to just wait for the police to find him, Claire conducts her own investigation. Her best friend Drew helps her look for answers, but all she finds are troubling questions. With every clue, she discovers that Greg may not be the man she thought she married. While battling her growing feelings for Drew and raising her two young children, Claire must learn to live with the knowledge that the truth behind Greg’s disappearance may never be revealed. Kate Moretti's debut is unbelievably intense. 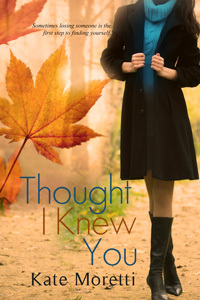 Thought I Knew You follows as a mother of two young girls questions the reality of being happy and having a successful marriage. Despite the mystery of Claire's husband's disappearance, and the what-ifs of their past and future, the story is supremely family-oriented. Claire's thoughts consistently revolve around how much her daughters' lives will change as the missing-person case takes its toll on their morale. Even if rare, Claire's situation could happen to anyone, and Moretti took care to find ways for readers to relate and connect to the story. Claire's reaction to her husband's strange disappearance is real, understandable, and most definitely engrossing. She goes through the motions, grieves, battles with rage, but eventually puts her kids ahead of herself. Claire learns to be strong in a time of great uncertainty, but not without the support of her family and best friends, Drew and Sarah. Her change in attitude comes with the acceptance that her marriage to Greg wasn't perfect and she may never have closure, but all the same, it's encouraging and inspiring to witness her ability to deal and move on. Thought I Knew You is such a full and satisfying read. The novel overall is consistently entertaining and will certainly leave readers eagerly waiting for another Kate Moretti novel! I've loved following the tour, looking forward to reading the book! Thanks for the fantastic review, Candace! I'm so glad you enjoyed it!